Meet Mrs. Bones! Our hot-new companion for our top-selling Mr. Bones polo is now available! 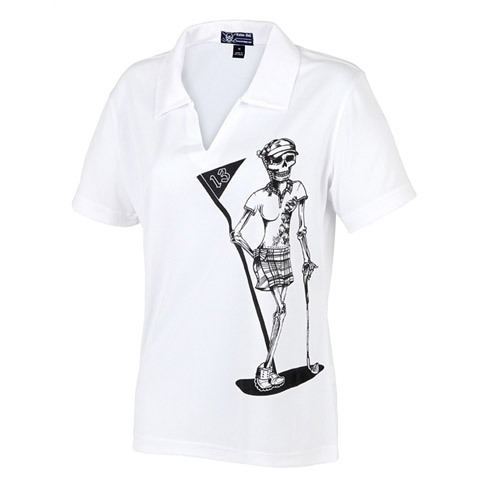 The newly redesigned Mrs. Bones polo features our lovely skeleton golfer ready to tee off and join Mr. Bones. This golf shirt is constructed from a uniquely textured microfibre knit fabric that wicks perspiration rapidly away from the skin, drawing it to the surface where it quickly evaporates. Double needle arm seams, shoulders and sleeves ensure superb durability. All-new skeleton design - you want to be different? This is the shirt that will help you accomplish that!